M/Y CARAMEL has undergone a price reduction of over €100,000 and is now asking just €720,000. A 21m motor yacht delivered by Ferretti in 2009, CARAMEL stands out from the crowd with her terracotta red hull that was repainted in 2016. 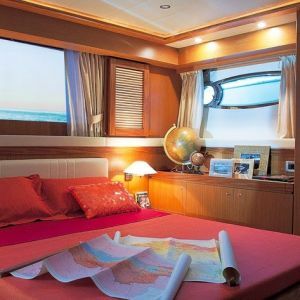 With naval architecture by Advanced Yacht Technology and the interior design by Zuccon International Project, she features large deck spaces and well-appointed accommodation for 6 guests in 3 cabins, all with ensuite facilities. 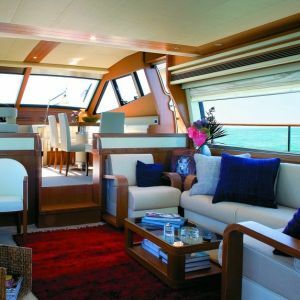 The saloon has a cherry wood interior, a formal dining area and a BOSE surround system. CARAMEL has all the amenities required for comfortable al fresco entertaining and dining. This Ferretti yacht also has a great swim platform, as well as sun pads and a Bimini top on the spacious flybridge. Hull number 18 of the Ferretti Altura 690 model, CARAMEL is powered by twin MTU engines and can reach speeds of up to 32.5 knots. CARAMEL is available for viewings in Marmaris, Turkey. Please contact Irina Blagodyr for further information on +33 620 16 40 56.